For the second year in a row, the Friona Farmers Co-Op Gin has set a new record for cotton bales ginned in a season. The new record of 44,028 bales is an 21% increase over last year’s record of 36,353 bales. In the past 18 years the co-op has ginned over 30,000 bales six times, but this is the first year that is has broken the 40,000 bale plateau. The quality of the cotton was also better this year as reflected in the co-op’s average loan rate being 52.28¢/pound whereas last year’s average rate was below 50¢/pound. This rate is based on a number of factors including color, staple length, leaf, extraneous matter, micronaire, length uniformity, and strength. Timely rains and an uninterrupted harvest helped pave the way for the record year. Gin manager Jeff Watkins said that missing the 10+ inch snow that hit in and around Lubbock also helped local farmers get their crop in. A lot of gins had to shut down for weeks because the fields were too wet to get the cotton to the gin. Improvements and repairs made to the gin last year also helped with the harvest. The co-op was able to handle round bales as well as modules. This year, 60% of the cotton arrived at the gin in modules and 40% was in round bales. 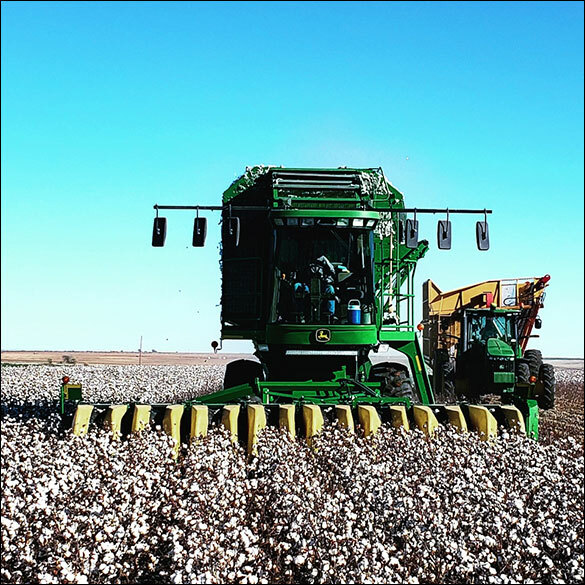 Mark Anthony Trucking of Friona hauled the ginned bales to the Farmers Co-Op Compress and RL Trucking of Bovina hauled the cotton seed. Approximately 17,000 acres of cotton were harvested last year, and indications are that more acres will be planted in cotton next year. Photo taken by Daniel Wiseman on Wiseman Farms south of Friona.